Brooke Landau had it all. The former high-fashion runway model had just graduated from college and was embarking on a career as an international marketing manager with a Fortune 500 company. Then a bite from a bug no bigger than a poppy seed changed all that. Her life was put on hold as she spent the next seven years battling a disease that almost cost Landau her life. A 1990 graduate of Ridgefield High School who lives in California, Landau was diagnosed with Lyme disease in 1995. "Doctors told me I might not live. But I had a different plan in mind," Landau said. "I've spent the last 7� years fighting for my life and my health � and surviving." Later this week, Landau will tell her story on NBC's Today show on a segment that features survival stories. "I wanted to talk to others because I would not have been sick for 7� years if the insurance companies didn't make money off of sick people. It's business," Landau said. "They were unwilling to help find a cure." Despite all the warnings, Landau, now a 32-year-old freelance reporter and producer, never worried about contracting Lyme disease. "I lived in Connecticut my whole life with deer in the back yard," Landau said. "I never thought twice about it. It's very scary. I don't think people can realize it can be a death sentence." While at her parents' home in Ridgefield in 1995, Landau remembered finding a tick on her leg. But the first symptoms didn't appear for more than five months. "I literally took a walk out the door to the mailbox," Landau said. "I didn't think anything of it." Landau, daughter of Frank Landau, now of Southbury and Dianne Landau of Malibu, Calif., said the disease attacked her suddenly. One day, she was fine and the next day she couldn't move her head or her legs. "On that fateful day, I was rushed to the (Norwalk) hospital," Landau said. "Doctors there informed me that I would die within 48 hours if I did not undergo an emergency spinal tap. 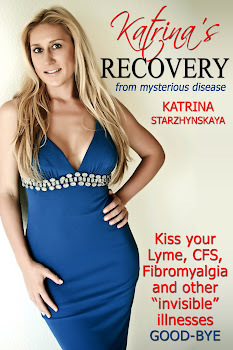 From the tap, the doctors diagnosed me with Lyme disease and spinal meningitis." She gave up her job and spent the next several months in her parents' Ridgefield home. Every day brought crippling headaches, muscle and joint pain and fatigue. Landau said she often was rushed to Danbury Hospital for emergency treatments. She experienced short-term memory loss and loss of hearing in her left ear. She began to lose sight in both eyes, developed heart arrhythmia, gallstones and colitis. She lost 30 pounds from her already thin frame � at one point the 6-foot-tall former model weighed 120 pounds. She has undergone various invasive procedures and treatments that included taking 27 pills a day. "Yet nothing has restored me to the pain-free condition I once knew," said Landau, who has undergone seven spinal taps and two surgeries. In 1996, Landau moved to Miami in hopes a warmer climate would lessen her joint pain. But, as the illness progressed, so did the pain. She eventually met a doctor who Landau said saved her life. By undergoing experimental treatments five years ago, Landau is able to do everything she could before � including working out at a gym, salsa dancing five days a week and playing volleyball on the beach. "None of which I could do for years," she said. "Brooke is a fighter," said her father. He remembers when she had several operations as a baby to correct a congenital heart defect. "It made her very tough. As a child, she always knew what she wanted. Her stick-to-it-iveness really showed during her illness. We're proud that she's never given up. But nobody should go through this stuff." Because she was considered a research subject, she wasn't responsible for the medical costs that mounted to several hundred thousand dollars. Treatment consisted of pumping high doses of antibiotics into her heart for 24-hours a day for two months. She also underwent 30 days of treatment in a hyperbaric oxygen chamber. "It felt much like lying in a glass-enclosed coffin," she said. "The treatment was torture, but on the last day of treatment, I awoke free of joint pain for the first time in years. My hearing improved, my sight was better and I even regained my short-term memory." Although she was bedridden for more than a year during treatment, Landau wanted to be productive. She started a non-profit foundation working on her computer in bed. Sponsored by MAC Cosmetics, The Children's Alliance Network (CAN) organizes models and make-up artists to do makeovers for sick children. "I was doing a lot while I was sick," Landau said. "But I would pay for it. One day of work could put me in the hospital for a week. I really believe that you can't curl up in a ball and let the illness get the best of you." Since the treatment, Landau considers herself almost cured. The only symptom left is the headaches. "They say I'm cured and that it's out of my system," Landau said. "They've determined I don't have Lyme disease anymore." Landau went on to be a television anchor and reporter for CBS and ESPN. She now works as a freelance reporter for ESPN and a freelance producer for E! Entertainment. The "Today" show opportunity came when she and an NBC reporter were covering the same story. "Though I will probably have some measure of chronic pain throughout my life, I consider myself among the lucky," Landau said. "Through it all I've found an inner strength to fight and survive."